GRP Piping Market size will surpass USD 8 billion by 2024; according to a new research report by Global Market Insights, Inc.
Sustainability will essentially be the foundation of the future piping industry. GRP pipes have been emerged as the optimal solution which not only involve innovative engineering, but increase the investment returns, as compared to the conventional pipe materials. These glass reinforced plastic pipes combine the benefits of durability, strength and corrosion resistance, and offer great design flexibility. These pipes are 10 times lighter as compared to concrete and result in an improved efficiency with lesser stresses, superior mechanical and chemical properties. GRP pipes meet the most stringent requirements as far as the chemical resistance and mechanical strength are considered. A recent study by the Norwegian University of Life Sciences concluded that on account of the high efficiency of GRP pipes, they have a minimal negative environmental effect, in contrast to the other pipe materials. Such trends will encourage glass reinforced plastic piping market growth by 2024. Hydropower has been the foremost renewable source of generating electricity across the globe, supplying as high as 71% of the renewable electricity. In 2016, about 16.4% of the global electricity was generated by hydropower, thereby reaching 1,064 GW of installed capacity. In hydroelectric power plant projects, pipe installations are realized in rough and steeply inclined terrain conditions. GRP pipes are easier to transport to, stow and install in such areas as they are much lighter than other products. Moreover, GRP pipes’ resistance against water hammer pressure is higher than steel and ductile pipes, as they absorb 40% of the additional pressure. The GRP piping market will witness substantial demand from the power sector by 2024. The escalation in demand for GRP materials shall be associated with higher manufacturing waste in the coming years. The waste disposal concerns in turn might hamper the overall glass reinforced plastic piping market growth during the forecast timeframe. Vinyl ester resins will observe the significant gains surpassing CAGR 5% in global GRP piping market by 2024. These are less absorbent of water than polyester resins due to a more tightly bonded structure of the side groups and are suitably used in the organic solvent environments. Vinyl ester-based GRP piping are used mainly in the aboveground applications with temperature up to 850°C. Polyester resins glass reinforced plastic piping market held a share close to 30% in 2017. These are used instead of vinyl ester and epoxy resins in some cases for their low cost and a faster curing time. GRP piping market will have high demand in wastewater treatment area in the next 7 years. Only 2% of the 165 billion m3 of wastewater that is collected and treated throughout the world is currently reused. Managing storm water and urban wastewater have been highly challenging, wherein GRP pipes will prove to be a sustainable solution by 2024. Irrigation increases crop yields by 2-5 times and about 40% of the world’s food comes from irrigated agriculture. Irrigation will be another significant segment propelling the overall glass reinforced plastic piping market in the near future. Global GRP piping market was led by Asia Pacific region in 2017. The regional industry will witness significant demand for these pipes from the power sector. For instance, in 2016 the total installed capacity for power generation in India was 3,30,154 MW and it will hold significant expansion potential in the coming years. 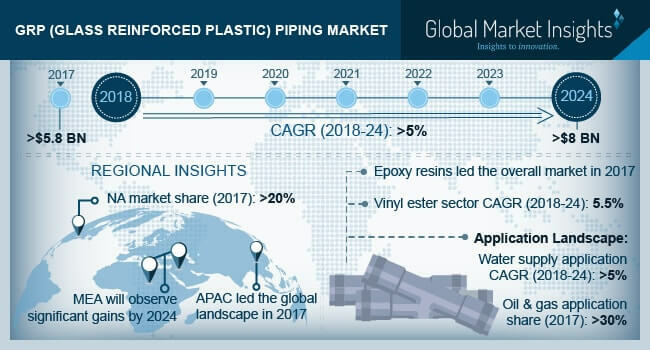 Few significant players in the GRP piping market include: HOBAS, Plasticon Composites, China National Building Material Company, SUPERLIT Boru San. A.?, Sarplast SA, TECHNOBELL Ltd., etc.